Coronal proton density images with fat saturation demonstrate high signal along the course of the MCL. 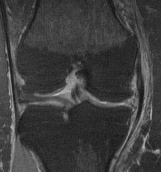 The proximal aspect of the MCL is thickened and demonstrates increased signal intensity. Grading of the MCL injuries depends on the degree of ligament involvement. Grade 1 injury refers to increased signal in the surrounding soft tissues, but normal appearing MCL. 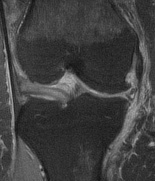 Grade 2 injury results in abnormal signal or appearance of the MCL, which is not completely torn. Grade 3 injury is a complete tear of the MCL.